An absolutely and indispensable guide to virtually every single available. 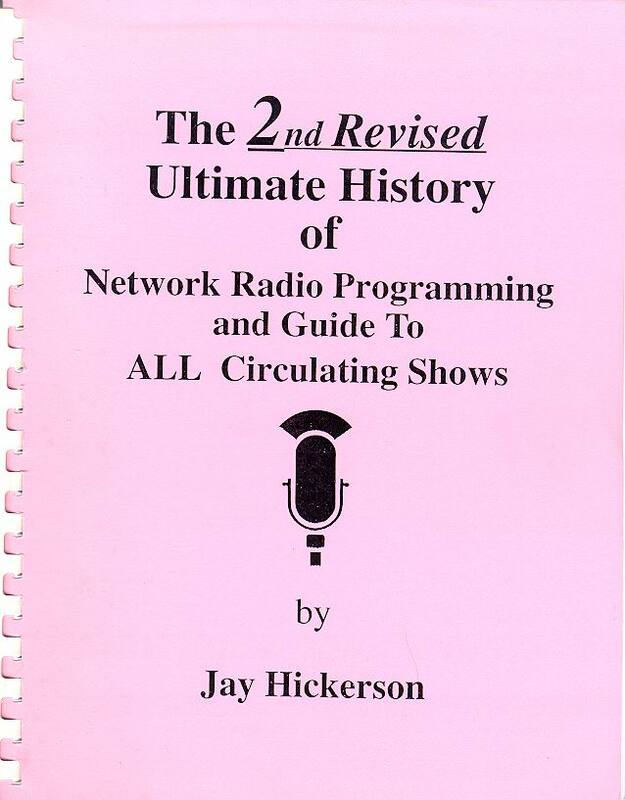 If you are just starting out to collect old time radio programs, or are searching for one particular broadcast, this is the bible for locally your quest. Original lists of circulating programs were made available from Jay Hickerson starting in 1986 and he finally published his first large combined volume in 1992. In October of 2001, Jay combined all his update supplements into his Second Revised volume. Each October he offers update supplements to this massive collection of data. This over 560 page reference book lists over 6000 network, regional, local and syndicated radio programs. Broadcast dates, sponsorships, network, air time, cast members, etc. are contained in this collectors bible. Many sources to particular broadcasts are given to help the collector find programs they want. I consider this publication one of the dozen or so tools that the old time radio collector must have. Currently, the cost of the 2001 "2nd Revised Ultimate History" is $55.00 plus $4.00 postage and handling which includes the October 1, 2002 first and second supplements. The second supplement to the 2nd Revised Ultimate History is available now for $6.50 including P & H. Both first and second supplements are $11.50 including P & H.
In addition to this large reference work, Jay also provides many broadcast logs, publishes "Hello Again," now in it's 35th year. Hello Again is the oldest independent newsletter dedicated to the traders and collectors of old-time radio shows. Much of the information it contains is contributed by collectors including: problems and techniques in dubbing, tape quality, what different collectors are doing and what they are looking for, updated info about new radio shows being circulated and logs related to old-time radio, deaths of radio personalities and much more. It also keeps you up to date on the annual Friends of Old-time Radio Convention. The next convention is Oct. 21 – 24, 2004 at the Holiday Inn-North, Newark, NJ. The first issue received includes listings of all OTR clubs, publications, many dealers and all logs available. It runs about 4 to 6 pages an issue. Subscription is $15.00 a year for 6 issues per year. Send a SASE for a complimentary copy. Back issues are $2.50. Full page ads are accepted. Jay's necrology listing of close to 3700 radio personalities; includes date of death and age at death. All those in radio full time or only occasionally are included including many movie stars and musicians. Please order at least $5.00 worth of logs. For every $5.00, please add 50 cents for P & H.
Jay is also the promoter of The Friends Of Old Time Radio in Newark, NJ each year. This great gathering of fans and performers has been held each year since 1971. One of the oldest and largest in the country.